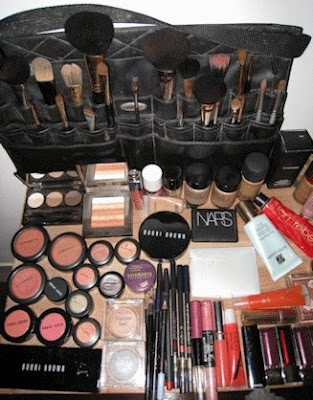 When was the last time you really looked at the contents of your makeup bag? You have that foundation you use every day and a few foundations you gave up on, a small pile of trendy eyeshadows, special occasion makeup. Your trusty mascara may be creeping up on birthday number two. I recently found some liquid eyeliner from high school! Gloopy (and therefore expired) nail polish isn't going to hurt you, but the bacteria growing on your face makeup can cause red bumps, pink eye and other health problems. Eva Gizowska of iVillage wrote about the shelf life of costmetics, how to tell it is old, and tips for making your makeup last. (I didn't know that lipstick only lasts two years and that perfume can be preserved by keeping it in the fridge.) The best way to make sure you're not using rank product is to write the date you opened it on the container. I found your blog very interesting, original and well done. This is the reason why I give you an invitation on www.vogueicon.com. Vogueicon is a social networking website for Bloggers, enabling you to promote your blog. After registration, you manage your own area, post articles, give marks or comments... and you have the possibility to create groups. An easy way to meet people and find a community of interest ! Find out more things on www.vogueicon.com and discover a new way of Blogging ! Best regards, and congratulation for your blog.